This is one of those recipes that came together on a whim and I decided to just roll with it. My sister suggested something with salsa and chicken for dinner, and i wanted rice and to use some cilantro from my mini-garden. After pondering awhile I decided to combine them and see what happened. I'll admit, I was a bit surprised at how well this dish turned out given its extreme simplicity. I was hesitant to even post it since it's so easy. However, I figured you would appreciate how quick and tasty this dish is, so I decided to post it anyway. I'll definitely be making the rice as a side dish more often. 1) Cut chicken breasts in half lengthwise (so you have 6-8 thinner pieces). Cook thoroughly however you wish, we grilled ours but you can boil or bake them as well. Sprinkle with your favorite seasoning. 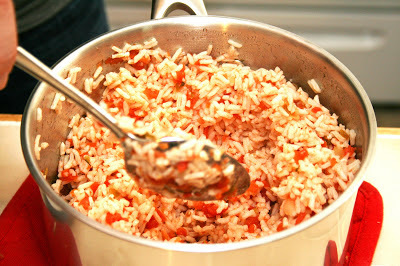 2) In a medium pot, combine water and salsa and bring to a boil over medium-high heat. Remove from heat, stir in instant rice, cover and let sit until rice is soft (about 5 minutes). 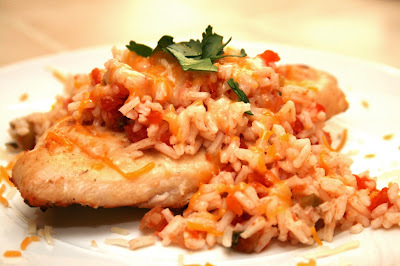 3) Spread rice mixture over cooked chicken breasts, or leave on the side. 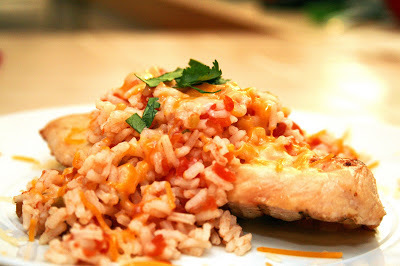 Top rice with cheese and some fresh cilantro.